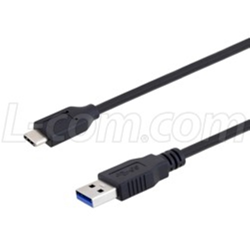 L-com Global Connectivity, a preferred manufacturer of wired and wireless connectivity products, announced today that it has introduced a new series of high-flex USB 3.0 cable assemblies with Type-A male to Type-C male connectors. Designed for applications where standard USB 3.0 cables would fail because of extreme flexure, these exclusive ultra-flexible cables are rated for a minimum of 10,000 flex cycles. Standard USB cables fail at approximately 1,000 flex cycles. Additional features include a polyurethane jacket and high strand count data (32 AWG) and power (26 AWG) conductors which provide extra durability. “These exclusive, ultra-flexible USB 3.0 cables are specifically designed to address applications where ordinary cables fail from excessive flexure. These durable cables can withstand 10 times as many flex cycles as a standard cable while maintaining USB 3.0 performance,” said Brian Gates, Product Manager. L-com’s USB 3.0 high-flex cable assemblies are in stock and available in 0.3, 0.5, 0.75 and 1 meter lengths off-the-shelf.